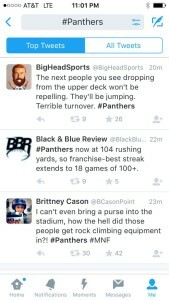 As many as 74,000 football fans at a Carolina Panthers game witnessed two people rappel from the upper deck in the pouring rain. 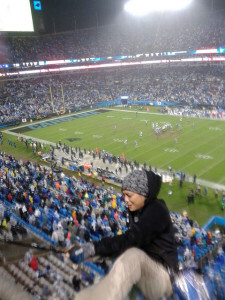 They suspended themselves in front of the press box and unfurled a banner from the railing above which read, “BoA: Dump Dominion, WeAreCovePoint.org.” The stunt was broadcast live on Monday Night Football, which had an audience of 12 million last week. 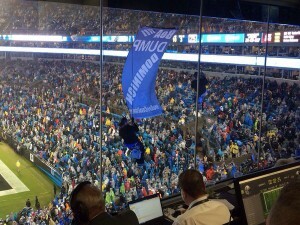 Carried out during one of the biggest match-ups of the season between the Panthers and the Indianapolis Colts, the banner drop was designed to shame stadium sponsor Bank of America for its financial backing of a gas liquefaction project on the Chesapeake Bay. Dominion Cove Point, now under construction, is poised to become one of the first LNG terminals in the United States to export natural gas. It is so far the only terminal geographically situated to export gas produced by the expanding hydraulic fracking industry of the Marcellus Shale. Cove Point LNG’s parent company, Dominion Resources, has been trying to raise the necessary $3.8 billion to get the terminal up and running. Bank of America is one of Dominion’s major backers. It owns shares worth more than $623 million, loaned Dominion $380 million in 2013 alone, and bought $275 million in bonds largely dedicated to capitalizing the Cove Point LNG venture. Although the natural gas and LNG markets are weathering tough times, Dominion Cove Point could still be a gold mine because of the contractual agreement with its two customers. No matter how much gas they ship, GAIL Ltd. and Sumitomo Corporation must pay the same toll to Dominion. But that gold mine sits on a powderkeg of 14.6 bcf of LNG, 410,000 gallons of propane and two 87-megawatt combustion turbines squeezed into the existing 130-acre site. Nearly 2,500 residents live within one mile of the terminal and could bear the brunt of a potential massive industrial catastrophe in their neighborhood. The high level of emissions produced by the plant is also a concern. Dominion Cove Point will become the fourth largest polluter in Maryland, producing 20.4 tons of toxic and cancer-causing pollutants each year. Environmentalists point out that the lifecycle emissions of LNG export, from fracking well to the ultimate destination in Asia or Europe, are worse than coal. Recent studies have shown that emissions of methane, a potent greenhouse gas, exceed previous estimates. 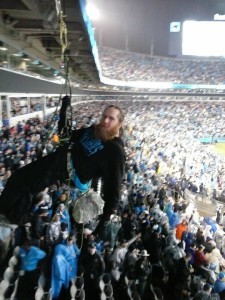 This isn’t the first daring maneuver designed to draw attention to Dominion. 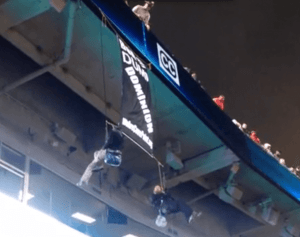 Last February, two activists climbed the arm of a crane and dropped a banner at a construction site; they were subsequently convicted of trespassing.